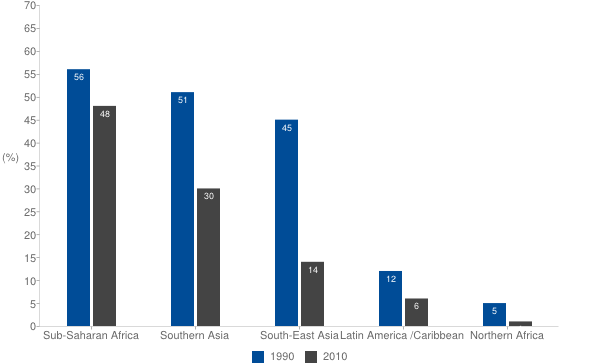 Proportion of people living on less than $1.25 a day, 1990 and 2010 (Percentage) (source: The Millennium Development Goals Report 2013)About 700 million fewer people lived in conditions of extreme poverty in 2010 than in 1990. The economic and financial crisis has widened the global jobs gap by 67 million people. One in eight people still go to bed hungry, despite major progress. Globally, nearly one in six children under age five are underweight; one in four are stunted. An estimated 7 per cent of children under age five worldwide are now overweight, another aspect of malnutrition; one quarter of these children live in sub-Saharan Africa. How much progress towards achieving the MDGs has been made in your country or region? What impact has there been for women?